As I mentioned in my blog How to create Service Request subject data by code I need to generate a large number of Service Request as test data which should have Subject Category filled randomly. 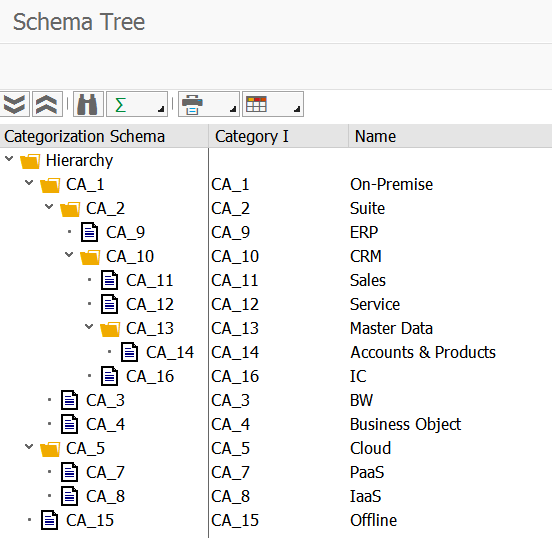 So it is necessary for me to figure out how to read out the hierarchy data of a given Categorization Schema so that I can spread it randomly to the created Service Request. 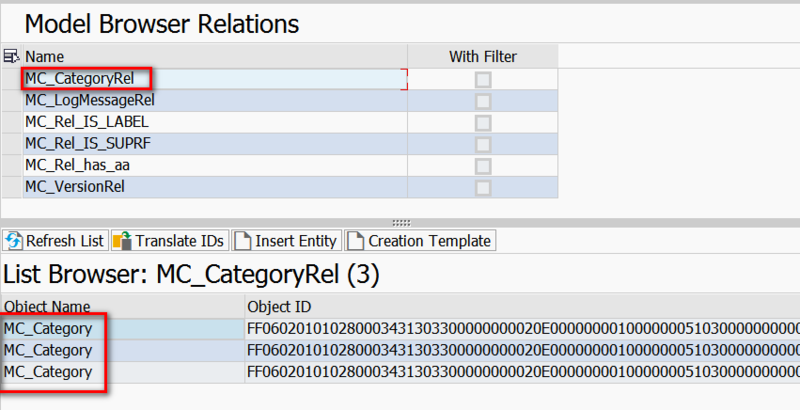 Then use relation “MC_CategoryRel” to get all Category node in first level. The category node has relation MC_TreeChildRel, which could be used to get all its children category nodes recursively. 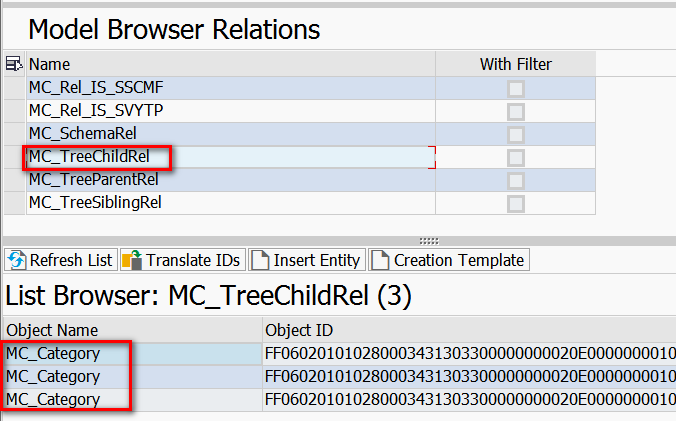 With this API, I have also developed a report to display the Schema tree in SAPGUI, which has exactly the same structure as displayed in WebUI. Source code for API class could be found from my github. PARAMETERS: schemaid type string OBLIGATORY DEFAULT 'WJ_SOFTWARE'. ls_data    LIKE LINE OF gt_data. DATA(lo_tool) = NEW cl_home_schema_tool( ). DATA(lt_fieldcat) = lo_tool->get_fieldcat_by_data( ls_data ). READ TABLE lt_fieldcat ASSIGNING FIELD-SYMBOL(<id>) INDEX 1. <id>-seltext = <id>-reptext = <id>-scrtext_m = <id>-scrtext_s = <id>-scrtext_l = 'Category ID'. READ TABLE lt_fieldcat ASSIGNING FIELD-SYMBOL(<text>) INDEX 2. <text>-seltext = <text>-reptext = <text>-scrtext_m = <text>-scrtext_l = 'Description'. FORM build_hierarchy_header CHANGING p_hierarchy_header TYPE treev_hhdr. An excellent information provided thanks for all the information (garageband for PC) I must say great efforts made by you. thanks a lot for all the information you provided. I follow your blogs often and believe me I have learned a lot from it. 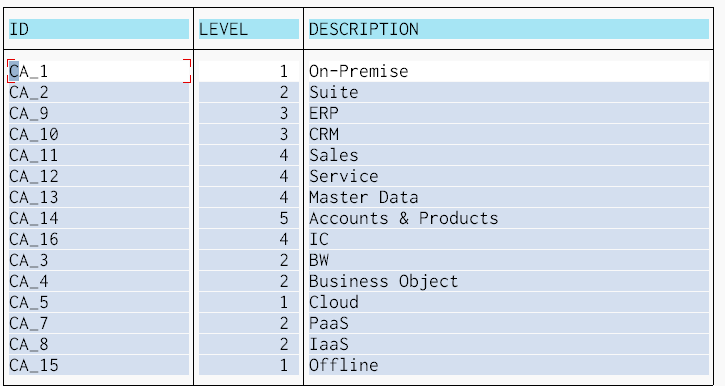 Coming to cat schema do you know if there any standard report to update categorization schema also.